Every house has its quirks. But when do quirks become unsettling? And at what stage do we stop attributing the unexplained to the house’s foibles, and begin to see someone, or something, behind it? Many years ago, before we had children, Phil’s work had a lovely big house overlooking the Atlantic ocean at Polzeath in Cornwall. It was well documented as being haunted, but its views were world class. You could sit and have breakfast looking out over the rugged straits where the Camel meets the Atlantic, munching toast whilst contemplating the Doom Bar where boats would be wrecked in olden times, providing plunder for ruthless local pirates. We booked it for a week, of course we did; what is a ghost in the face of that location? And we invited the extended family down. Everyone trooped in and took up residence and oohed and aahed. And I did not say one word about the ghosts, and hid the visitor’s book which told of phantoms knocking on the door and strange things flying about the place. My youngest brother is a bit of a sensitive. The night after he arrived there was a great Summer storm. The next morning, I found him checking the windows in an unoccupied room. “What are you doing, Pete?” I asked. He could find nothing which explained the strange phenomenon. And I stayed mute. He had to sleep there for a week after all. The Slavic nations found a perfectly satisfactory way to explain such phenomena. They were made by Domovoi. Simple: no need to fear ghosts; the unexplained was the house-spirit at its tricks. The domovoi were said to be hairy old men but they could take other forms, dogs, or cats, or even the house owner. There have been reports of people seeing the owner in the yard whilst he was fast asleep in bed. They are seers for the family. That unexplained crying just days before someone dies? It’s the domovoi. Someone pull your hair in the kitchen? The domovoi, warning of an abusive partner. The domovoi would laugh when the fortunes of the family were good, cry when they were bad. And when they were unhappy, they took the same action as any self-respecting poltergeist. They hurled things about, and knocked on doors, and rattled windows and made themselves generally objectionable. When you moved, you tried everything in your power to take the domovoi with you. On moving house, it was advisable to cut a slice of bread and leave it under the stove to tempt the family domovoi. Everyone’s house has its foibles. Every house has a character which, on occasion, reverberates with the unexplained. And now you know who it is. A word in your ear: be hospitable to your domovoi. Posted in Folk talesTagged domovoi, folklore, house spirits, russian folk takesBookmark the permalink. So kind of you not to upset your brother – hahahaha 🙂 I like this idea of the Domovoi – very civilised and explanatory. I wonder if a really old house can have a whole bunch of house spirits and new houses need some encouragements to attract the odd spirit or two. I think that is precisely how the Slavs saw it, Gabrielle. You had to tempt them along to start with – but even the bath house had a god by the end! Forgive me if I mentioned it on one of your earlier posts but we’ve always loved the explanation that it is “el brazo de Onofre”. It comes from the Milagro Beanfield Wars where there was a one-armed man. All the unexplainables were attributed to that lost arm. It is amazing how much an arm can take the can for, Tamy 😀 Brilliant example of another folkloric belief which helps us explain the unexplainable and gives us someone to take the blame. Sounds like a wonderful house – regardless of the inhabitants! It was an amazing house, Michael, and we did enjoy our time there. Mostly. We live in a 115 year old house. We have had the good fortune to have met the previous owner, Gladys, who lived here as a girl and then raised her own family here. She lived 65 years of her life in this house, and her father had been quite proud of the old home. According to Gladys, her father (Mr. Loveland) was mortified when she chose to paint the woodwork of “his” house, and even more upset when she put wall to wall carpet over all his old oak floors. If our home has a Domovoi, it’s name is Mr. Loveland. We have always felt protected and embraced in this home. Every change we make, we ask ourselves, would Mr. Loveland approve? Mind you, I had not shared my carpenter’s experience with my neighbors until AFTER they said something. Kanniduba, I read this a few days ago, and it has been playing around in my head. It is an amazing story! Thank you for sharing it! The thought of your domovoi, keeping a watchful eye but loving the family which inhabits your house; it’s irresistible. No, I don’t think I ever did, Judy. MAybe I will, one day. Well, that it explains it. 😀 It was the domovoi all along. Quite. It is, how shall we say, politic, Sidey. Notwithstanding my earlier rants about bogeys and imaginary creatures, I do accept that strange inexplicable things do happen, and that if they happen to you it can leave you shaken and stirred. We all have anecdotes, don’t we? One of mine involves a mother-in-law’s moment of death in Yorkshire and the simultaneous explosion of a glass beaker in our Bristol home. So I don’t pooh-pooh this at all. Or the experiences kanniduba’s third parties had. What I find difficult is any simple cause-and-effect explanation for these happenings, tempting though they may be. For all my prosaic nature, I’m happy just to put it down as weird. I have read that, and never made the connection, Chris! It’s a very Blyton sort of place, all white arty thirties houses on the cliff. One of Betjeman’s favourite places of course; he is buried just over the hill at Daymer Bay. It would be great to know they were on your side, wouldn’t it? 1. This is first hearing (for me) of a younger brother on your side. Are there just the 3 of you . . . or do you have a fourth? Did he having any additional paranormal encounters that week? 2. 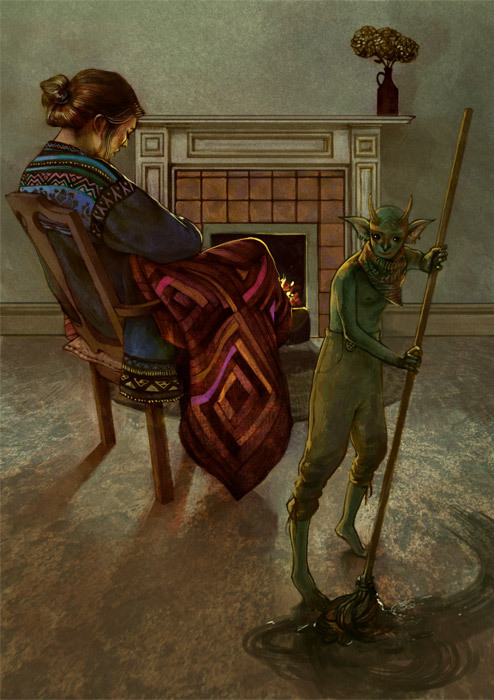 A domovoi sounds a bit like Dobby, the house elf, who would die to protect Harry Potter. 3. When you said that your marriage vows included the promise of adventures, you weren’t kidding. A week’s stay in a haunted house certainly qualifies as an adventure . . . especially with midnight carpenters boarding up the windows against the presaged storm. And @Kanniduba ~ I enjoyed hearing about Mr. Loveland. Maybe if you ask him nicely, he’ll allow “housesitters” access in the future? Well spotted! Rowling undoubtedly based her ‘Dobby’ on the ‘Dobbies’ (or house spirits) of Yorkshire. Elsewhere in Britain, they’re known has hobs, brownies or lobber fiends. They are basically the same as these Domovi by the sound of it. That’s quite some comment, Nancy 😀 You covered a lot of ground! I had not registered the dobby connection, well done on that. There are four of us, two boys, two girls. Pete is the youngest and the least conventional. He now lives just opposite the Isle Of Mull in a small fisherman’s cottage, with solar panels and windmills and log burners, teaching counselling and surfing. One day we will get together and talk about that week. But as yet, I have not asked whether he experienced anything else…. Thanks, Kate. Pete sounds like a bit of a free spirit . . . perhaps that’s why he’s tuned into things that go bump in the night. Neat post. 🙂 I’m always interested in learning about new “house spirits”. The Eqgyptians had their personal house gods too, which were supposed to be rather similar. It seems out secular, house-spirit-less world seems lessened, doesn’t it? It does seem a little cynical these days, Shelly. One reason why I love seeking these little deities out. I grew up in an old house built by my father’s uncle. Frequently the back door would swing open for no apparent reason. We assumed it was Uncle Chester who opened it and always greeted him cordially. Our indigenous people call them Tokoloshe. We built our house and yet sometimes I feel a presence! I had no idea that’s what that term meant, Tandy! Thank you! At last it explains things, Bano! I agree. I like the thought of a domovoi. I think I would welcome such a watchful presence. However, I’m glad you chose this particular image to illustrate the post…..some images I found looked much more malevolent. Maybe they are attuned to the personalities of the homeowner? Remember, Karen, we are dealing with Russian folklore which is far from tame. It has a wild side which has virtually no limit to obscenity and violence, a little like Grimm but much, much more unsettling. The domovoi has two sides, benign and destructive, and each has its fairy tales attached. Once again, Kate, you’ve introduced me to something I’ve never heard of before. This post and the domovoi bring to mind tales my grandmother liked to tell about a knock on the door right when her second son died. When the door was opened, no one was there. I seem to recall her also mentioning a clock stopping at the moment her brother died. She rather enjoyed regaling us with these disturbing tales when I was growing up. No wonder I was a very nervous kid. I know, I remember being told about the banshee wailing before a friend’a relative died…even Grimm did not mince his words when addressing his tales to children. It seems we have to have not only a peck of dirt before we die, but also a half-measure of horror. Love the image, Kate, and this all reminds me of a girl from college who lived in a house once used by members of the Underground Railroad, which brought slaves to freedom. Her house had passageways and hiding places – and a dog who would disappear for days on end and then, suddenly, come up from the basement. I remember that post of yours, Penny, and was fascinated. A domovoi from that house would be a complicated character indeed. Fascinating, and the comments are, too. I have known a few places with a definitely bad ‘atmosphere’ which seems to clear after being swamped with kids and pets. Even though, at first, it freaks out both categories. I’m glad you cleared that up for me, I often wondered what the apparition I see in the bathroom mirror is each morning. I always thought it was me in need of a shave. Now I know differently the War Office will be happy. 😀 Glad to be of service, Brian!